Here, to keep you occupied while I work on something else, is a very short extract from a first draft of something else. It’ll need a bit of work. The context is that it comes amongst a long discussion of societal and judicial attitudes to dangerous driving, including the right to drive and our reliance on cheap road haulage and distribution with lax regulation, and illustrated with several of those case studies with which we are now all too familiar. (The pictures aren’t part of the extract, I’ve merely taken them from the Rail Safety and Standards Board Annual Safety Performance Report, and from STV news (warning: autoplaying audio/video)). In 2011, a railway worker was killed. Just one. His name was John McInnes, an infrastructure maintenance worker who looked after lines in the north of Scotland. McInnes had thirty years of experience in a job that can come with all the hazards of working alongside fast trains, around heavy machinery, on high structures and amongst live wires. He was killed on the evening of the fourth of July 2011, while travelling to a work site on the Highland Main Line at Kingussie, only five miles from Crubenmore, where this whole story started. But McInnes did not die on the tracks. 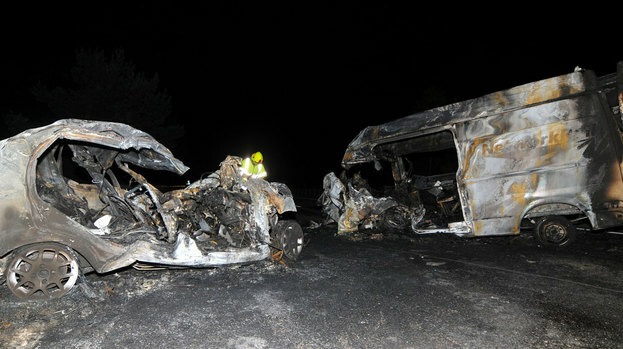 Accessing the work site by the A9 trunk road, his van and a car crashed with enough force to spark a horrific inferno that took firefighters 45 minutes to control. This ironic tragedy highlights the already stark contrast between safety on the roads and safety on the railway. 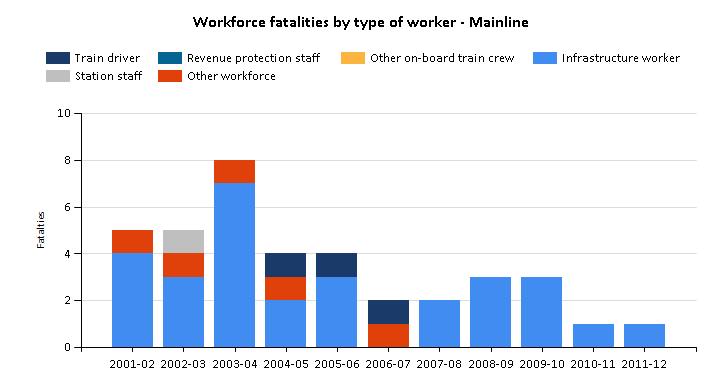 For more than a decade, railway workforce fatalities have been measured mostly at the low end of single figures, and five years have now passed without a single passenger or crew member having been killed in a train crash. There wasn’t always such a profound difference between the safety cultures of the road and the railway. The navvies who built the Victorian railways were treated as expendable labour by powerful company owners who fought safety regulations, not only during construction, but also in everyday operation. Even when the railways were nationalised in the late 1940s, the toll on the workforce was still more than 200 every year. But strong unions demanding their right to safe workplaces, and public opinion demanding change when things go spectacularly wrong — as when major crashes occurred during the Railtrack era — has ensured that, these days, many layers of safety are built into every part of the railway. The railway industry investigates not only all of the deaths on the tracks, but also the injuries and near misses below them in the Heinrich Triangle. The Rail Accident Investigation Branch makes extensive inquiries, consults the detailed operational records, and reconstructs events, leading to fifty page reports highlighting the lessons that are to be learned, the working practices to be revised, the rules which must be better enforced, and the new technology which should be adopted. The occurrences that it investigates are mostly what we would call accidents. Nobody was really to blame, and it is not the intention to find anybody to blame, only to prevent anything like it from happening again. And so we have developed signalling systems which make it almost impossible to accidentally crash a train: train positions are automatically detected and the system keeps them apart by lengths of several train braking distances, refusing to allow the signaller to put trains on collision courses and automatically triggering the brakes if the driver fails to stop at red. Engineering work is checked and double checked and measured automatically by high-tech high-speed engineering trains on rolling schedules. In the event that engineering work must be carried out during live traffic, the engineering gangs work with dedicated trackside lookouts using flags and air horns to warn of approaching trains, while drivers sound their own horns until all workers have ensured their position is safe and signalled a clear acknowledgement in reply. The railway has developed a culture in which staff at all organisational levels respect the fact that the railway is a hazardous work environment and that they must take seriously their responsibilities for the safety of their colleagues and passengers. But it did not achieve its enviable safety record simply by demanding respect and courtesy, and nor did it do so by imposing harsh penalties on workers whose momentary misjudgements ended in catastrophe. It designed a system which forgave those misjudgements: one which accepts that when humans are in control things will go wrong, so the system should be designed to allow humans to make minor mistakes and recover from them before there are any consequences. In 2011, the Rail Accident Investigation Branch did not have to investigate a single worker death. John McInnes was on the road when he died at work, and when you work on the road, you’re still expendable labour. It does, however, impose harsh penalties on individuals who knowingly & intentionally operate outside its conservative safety parameters, and puts a strong onus on managers/operators to ensure that no worker, or, where appropriate, passenger, can be in any doubt as to what those parameters are; the way timetables are managed is also something to learn from:- the spare margin inherently built in to the system to recover from minor delays, and the prevention of any incentive to complete a movement ahead of time. AFAIK the regulations around long distance road haulage incorporate some similar measures, if not monitored quite so closely; none of it applies to construction traffic or suburban delivery vehicles; as to taxis & PHVs there’s more effort put in to making sure the driver won’t attack his passengers than in making sure they’re fit to be behind the wheel in the first place. Network Rail, notiong a clear mismatch between the number of RIDDOR reported serious injuries, minor injuries and dangerous occurrences, with the near mis and minor figures far too small for the normal pyramid profile, commissioned the RSSB to review this – it makes interesting reading. Angus hits a clear point, which has been picked up by the Traffic Commissioners, who are the road industry regulators. In his final report (2011) the retiring Commissioner (NE TAO) Tom McCartney railes at the lack of a clear protocol to feed his office with details of traffic infringements and reports on vocational licence holders, and the operators whose vehicles they drive. In one year he reports just 2 referrals from the Police in his area, called in for interview. Yet these Commissioners have powers to revoke LGV, PCV and operators licences, but rarely do so given that the legislation and the courts fail to back their actions. If an operator has a licence revocation, they can appeal, and continue to operate whilst the appeal is being progressed. With effective reporting and recording would Denis Putz have still had a licence when he killed Catriona Patel, or would the trail of crashes left by Joao Lopes seen him pulled in before killing Eilidh Cairns and then Nora Gutmann – even the detail of who was actually employing him, and providing the killing machinery/truck for the second crash seems confused. It cannot escape notice either that not only is it LGV’s – 5.5% of vehicle count, deliver 20% of fatal crashes, but on particular group of those LGV’s (4 axle 32T construction site vehicles) show a marked prominence in this respect, and often a small number of operators/operator types feature especially. Thus a targetted effort on a very very small number of operators* and vehicles and the work they are being used for could have a major impact. *In 2000 I was on the scene shortly after a young female cyclist had been killed by a 4-axle concrete mixer truck, making an illegal short cut by turning into a narrow lane (banned to HGV traffic), a left turn but from the right hand lane of a 1-way street, presumably in haste to cut across the traffic in the left hand lane – ignoring the cyclist. I later learned that this same truck over just a few years, had killed another young women on a bike, and put one more in a wheelchair – twice with the same driver. Nail this clear failing and we might just be on the way to safer roads. Of course one way to deal with the hazard is to manage the risk. At St Pancras there are 2 major sites and for 2 months up to 50 x 32T tipper trucks were making 150 trips per day from St Pancras to Pitsea with spoil excavated from the site – 5000T per day. In the process these trucks damage roads (they are the most damaging type of truck on the road according to DfT) and spreading noise and emissions pollution across the city. Yet within 0.5Km of the site is a rail facility to handle bulk materials (inbound aggregates and cement for a concrete batching plant) and other disused rail trackbeds which could take a loading siding. The river Thames is not that much further to travel and barges of up to 2000T capacity can still work up to Battersea, with the wharf by Cannon Street normally occupied by a 500T barge carrying 20 25T waste containers. The prospect of the 3 sites on the South Bank (estimated to generate 300 lareg LGV movements/day) plus an even bigger site at Elephant & Castle, all firing trucks on to the A2 and A23 is a horrific prospect. One small ray of hope is that TfL has decided to reinstate the Freight Unit, following from the success of its temporary revival during the Olympics. Individual developers are unlikely to set up rail and river transfer stations for their smaller projects but a co-ordinated TfL-driven effort could offer low cost bulk haulage with key gains to the City in reduced road damage, and pollution, as well as removing these most dangerous vehicles from city streets. Was it you, Dave H, who commented elsewhere that there are other options for trucking in and out of the three sites along Upper Ground, where Southwark had planned to close the road for a year until they realised that they had not considered suitable alternative safe cycling routes? Certainly, someone pointed out that those sites are immediately adjacent to this big watery thing called the Thames, which daily carries large quantities of waste on barges down to landfill sites further out to the east. It was also mentioned that these tipper truck drivers get around £100 per trip, and can at best manage 4 trips per day. This is in itself a scandal, and in my view a key factor in why tipper trucks are so dangerous – the sheer meanness of the compensation paid to the drivers (remember this is not a wage, it is a fee for the driver and the truck together, with its fuel, tax, insurance, depreciation, maintenance etc, on a vehicle which when new will have cost tens of thousands of £) is only one aspect. The other is the “per trip” charge scales. We see this also in the large scale minicab operations – at Addison Lee, a driver is paid a set amount per trip, in a fairly short list of distance bands, however short or long a time it takes to complete each trip. From that he has to pay a “lease” charge for the vehicle, which takes no account of how far he drives or how many trips he is able to make in a day. While not condoning their behaviour when they drive carelessly or dangerously, I think we need to understand why – many of these guys are living close to the edge and the temptation to cut corners (literally) to get in more trips and so scrape a living for themselves and their families must be almost overwhelming. Among the other things we need is a decent system of regulation to enforce standards but also to ensure that customers pay a fair rate for the service. If that makes the Shard more expensive to build, so be it – it simply means that the developer is footing the whole bill instead of laying a lump of it off on the public purse. Of course it will never happen while we have a government whose principal focus seems to be on quango bonfires and “cutting red tape”. I have cycled the A9. In places it is difficult to avoid. It is also a road engineered to kill. My companion was actually clipped by a car mirror (thankfully retaining control). I don’t think that comes from “recovering from minor human mistakes”. great article. Read it 4 days ago, and it keeps reappearing in my mind: great examples of political choices, management execution (realising those choices) and the results in numbers: in short – safety CAN be done, though not easily. I’ll keep my fingers crossed for you across the pond to have decent cycling experiences. Anything we can do to help? GoDutch conference sounded as a bit of progress…..?